I've been making Christmas decorations with my mum. 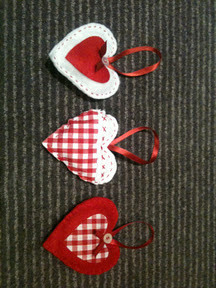 Red and white hearts to be precise, very scandi Christmas! Now I know that they are very clearly not food related but try are in keeping with the #letsmakechristmas theme and they really are quite easy to make. My mum is far better at sewing than I am but even my poor needle skills can cope with these! 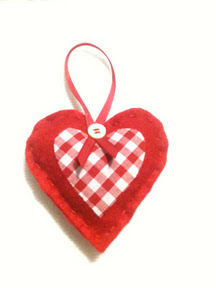 You can also you the same method for year round hearts to dangle off drawer handles, door knobs, pins etc. You can also stuff them with a little lavender or a few drops of fragrance to make hearts to put in chest of drawers between your clothes. Start by drawing a template of a large heart and a small heart on the card. You can do it by eye, use a cookie cutter or print a picture of a heart off the computer. I prefer the rounder hearts for this than the longer pointy ones. You could also do stars or stocking shapes or anything you fancied really but I like the hearts. 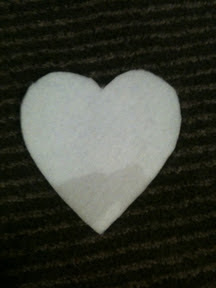 Fold your felt in half and pin the large heart template to the felt. Cut around the template through the two layers of felt so that you are cutting the front and back of your heart at the same time. This will ensure that the hearts are the same size. If you do this stage with material it is a good idea to iron some bond-a-web onto the back of the material before cutting out the heart to make it a little stiffer. As felt is quite thick there is no need to do this step for felt. Unpin the template from your hearts and put to one side. Take the small heart template and draw around it onto the smooth side of the bond-a-web. Roughly cut the heart out leaving a bit of a border around be edge. 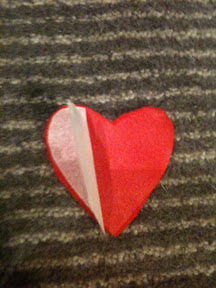 Place the cut out heart on a piece of contrasting felt or material. Take an iron and iron the bond-a-web to the material for about 5 seconds. Check the material is stuff to the bond-a-web. If it isn't iron for a few more seconds until it is. Now cut around the small heart you drew so that you end up with a small material heart with bond-a-web stuck to it. Peel off the white layer of paper from the bond-a-web. It can be quite tricky to find an edge but be patient and you will. Now take your two large hearts and place the small heart in the middle of one of them. Iron it on for about 5 secs or until it sticks. Now pin the two hearts together with the one with the small heart on at the front. Take your needle and thread your embroidery thread onto it. Either a matching or contrasting colour is best. 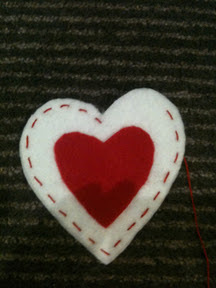 Starting at the top in the middle carefully sew a basic running stitch around the heart about 5mm away from the edge. Take your time with this and try and make all of the stitches the same size as they will be on show. If they look too different or scruffy simply unpick one and try it again. Leave a gap of a couple of cm at the top of the heart. Take small pieces of padding and gently push them into the heart through the gap you have left. Push them into all of the edges of the heart but don't over stuff it. Once you are happy sew up the gap. Finish the heart by pushing the needle through the whole heart from the back to the front in the top centre. Thread on a length of ribbon folded into a hook and a button. 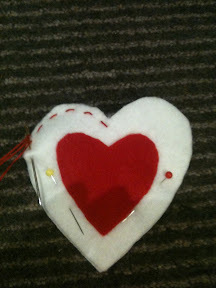 Sew the button and ribbon onto the heart (pushing the needle all of the way through the heart each time). Try to keep the holes of the button lined up horizontally so it is neat. 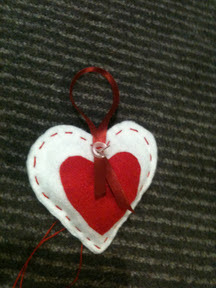 Finish sewing the button on by ending up with the needle at the back of the heart and tie off your thread. 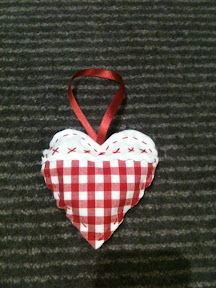 You can either use these as decorations for your tree or tie them to a long length of ribbon or rope to make a garland. Enjoy!